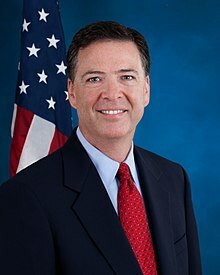 James Brien "Jim" Comey, Jr. (born December 14, 1960) is an American lawyer an umwhile Director o the Federal Bureau o Investigation (FBI). ↑ Comey, James (July 7, 2016). Hillary Clinton Email Investigation. C-SPAN. Event occurs at 01:43:06. Retrieved July 7, 2016. I have been registered Republican for most of my adult life. Not registered any longer. This page wis last eeditit on 29 August 2017, at 10:39.